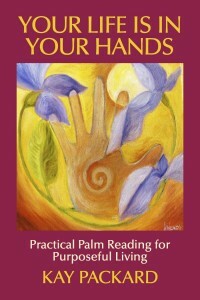 Your Life Is In Your Hands is a revelatory new book that teaches you the fundamentals of how to read the unique markings found on your own hands. Author and master hand analyst Kay Packard draws on thousands of hours of scientific research to guide you step by step in identifying and interpreting these markings, giving you a profound new approach to harnessing your inner wisdom and helping you create new, more successful life strategies. Your own hands offer the most reliable and explicit assessment tool available for living your best life! Learn to decipher your conscious and unconscious life patterns and awaken your self-knowledge, understanding, and wholeness. Are you ready to look within and empower yourself to live your most meaningful life? Your hands can show you how! This entry was posted in Book Status and tagged hand analysis, How to read hands, learn to read hands, love life, palm reading, Palmistry, personal growth, scientific hand analysis, Your Life is in Your Hands on June 17, 2014 by Kay Packard.